I saw this and I was instantly transported back to 5 years ago when this tiny dancer was all legs and so clumsy. She loved tutus, sparkles and dance. When you are a dance MOM, every year could be the last one. You pray for a teacher that will keep her interested. You pray that she will always feel good about herself in those tiny little sparkly costumes. I love watching my daughter dance. And I am blessed to have found a studio that keeps her attention and feeds her dance love and her social Butterfly love all in one place, two days a week. Thank YOU Robinson's School of Dance. The week dance recital costumes come in, I plan a delicious photoshoot for my daughter. Every year - since she was three - She will be 11 this year. And then I blow up my favorite portrait from the shoot Gigantic! Last year I went 30x30. Crazy or just looking at this amazing life with love goggles? She hasn't even been measured yet, but I'm already looking forward to the arrival of the 2019 costumes. 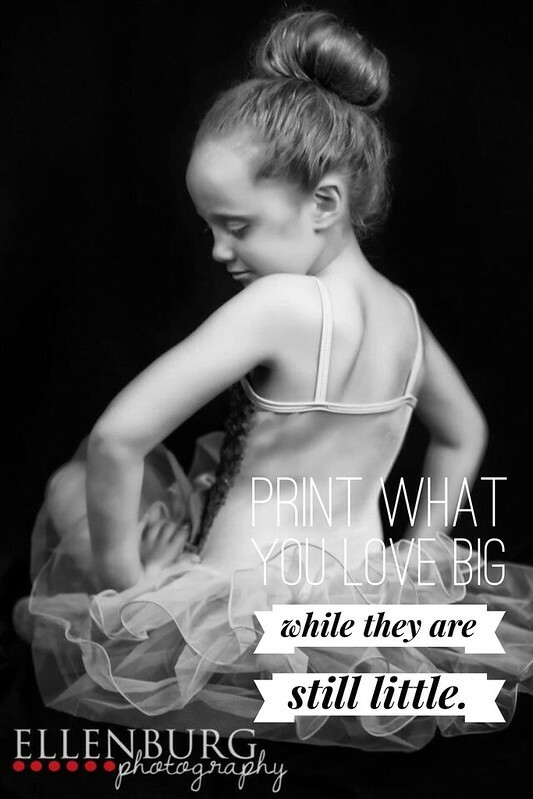 Every year, print something you LOVE big. They are only little for a little while. Celebrate this beautiful life with beautiful portraits of the memories you are in love with. It's your life and what you print is what you will remember. How will you remember this beautiful life? To see more beautiful portraits of little people, visit our website. Got Questions? Maybe about what should I print big? or Where should I put something big? Leave us a comment or reach out to us directly. Ellenburg Photography is HOME of the SANTA EXPERIENCE!